Does Nasacort Allergy Spray Really Work? Sometimes, allergy symptoms are unbearable and hinder the productivity of your day by slowing down your body’s functions and fogging up your head. Whether it be from the seasonal pollen in the air, indoor allergens like dust and dander, or another unknown allergy trigger that you can’t identify, there are effective medicines that can ease allergy symptoms and restore clarity to your day. 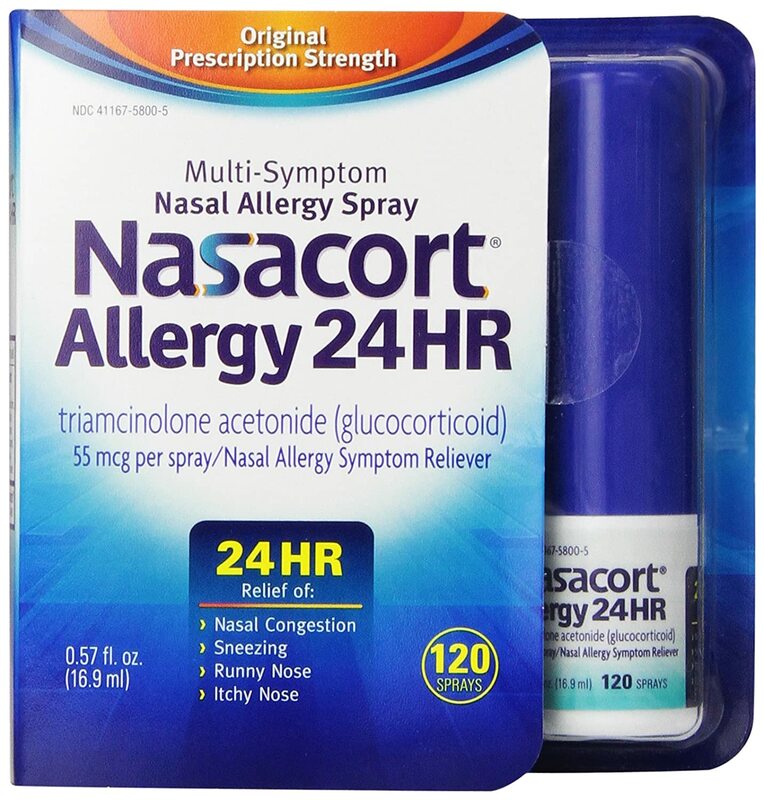 Here is my personal Nasacort nasal spray review in which I am going to examine the benefits versus long-term risks and the comparisons between it and other allergy sprays. Check out a killer price here on Amazon for 50% off. Forget buying it at your local store. When I was in high school, I was pretty much known as the “Allergy Boy” because my allergy symptoms were so harsh and unbearable. I couldn’t hide it for the life of me because my nasal congestion, excessive sneezing, nasal drip, and headaches were unbearable. It was so bad that when I tried to blow my nose, I simply could not blow anything out because I was so incredibly congested with dense, drippy mucus. I’m sorry for that gross imagery, but my fall, spring, and summer allergies were so bad that I don’t know how to begin describing or complaining about them. This was at a time in my life that I didn’t seek any type of treatment from prescriptions or nature, don’t ask me why I didn’t try to solve this annoying problem. Perhaps I was a lazy, hormonal, depressed teenager that would rather not think about the long-term future of my health. This was about seven years ago and the beginning of me getting the necessary motivation to seek treatment. I did not even consider natural remedies or changing my lifestyle to improve my allergy symptoms, so I listened to my ignorant family members and doctors that recommended I pop pills and snort liquids to deal with my problems. In my entire life, I’ve probably tried out the majority of allergy nasal sprays, including Nasonex, Patanase, Afrin, Flonase, Astelin, Astepro, Omnaris, Zetonna, and alright that’s enough I’m gonna list because I sound like a burned out druggie for allergy meds. However, there was one allergy nasal spray that I think worked best for me and that was Nasacort. I am not using Nasacort anymore because I have learned about the root causes of allergies and about gentle, natural treatments that can ease symptoms without causing a physical dependency or other annoying side effects. If you are using Nasacort or another generic brand of triamcinolone or you are considering it, let me share some useful information with you from a seasoned allergy sufferer (me) to help you out. Does Nasacort Have Side Effects or Drawbacks and is it Worth it? This site is all about getting rid of the chains that we have in life regarding our health. Some people call these substances addictive drugs and others call them helpful medicine. I think they could be both because on one hand, people insist that some drugs help them and it’s worth the side effects, and on the other, you are always altering your body in unknown ways by using them and there are certainly risks that are difficult to analyze right now with the state of our research. Nasacort or the ingredient triamcinolone is considered one of the most effective allergy sprays on the market right now and it is in competition with a few other effective sprays like Flonase. All of them have their benefits that are different from one another. I believe that everyone is different when it comes to any medicine or drug because some will say that one is ineffective and another one works while another person would say the complete opposite. You may be wondering if there are any long-term effects of taking Nasacort or other nasal sprays like it, as well as any short-term side effects you’ll need to consider as well. Triamcinolone is a steroid that prevents the release of histamine and other inflammation-promoting substances that your body releases in response to the exposure of allergens to your body. This means that it is on the harsher side for the treatment of your allergy symptoms. Everybody is different, so if you notice a serious change in your health after starting using triamcinolone, please contact your doctor for their advice. Then, you can consider trying another allergy treatment spray, or another alternative that will not cause these types of effects. Use nasal sprays properly this way. Tilt it towards the side of your nose, rather than the inside. Is Nasacort Addictive and will it Cause Withdrawal Symptoms? The simple answer is: Yes, triamcinolone can cause a physical dependency that will eventually cause an addiction and withdrawal symptoms when you stop taking it. This is usually the case for most sinus steroids because they have such a huge effect on your health. So how does Nasacort work? It basically uses its steroid mechanism to forcibly open up your nasal passages, instantly calming inflammation for a short period of time. This relieves symptoms of nasal congestion, sneezing, running nose, and itchy nose. Users report that there is relief within the first time of using the allergy spray, and others say that it took up to a week to see the benefits of using it. Personally, I see immediate results. If you look for the answer to the question “can Nasacort or triamcinolone cause an addiction or physical dependence with withdrawal symptoms?” then the internet is likely to give you biased unreliable results. This is because when you search that question, the literal website for Nasacort comes up with an FAQ that tries to answer this question. Because they want more of your money. They don’t want you to be afraid or doubt their product. Basic marketing and advertising teach you that when consumers doubt or have negative emotions about a product, they don’t buy it. Let’s be honest, everyone loves money and you need to be more skeptical about this type of stuff. If you searched on the internet for a comparison of these most effective nasal sprays, then you will again likely receive a biased result that doesn’t give you an honest, efficient answer but tries to get you to buy something. Thankfully, I have experience with using all of these nasal sprays. Simply, Fluticasone or Flonase was not that effective for me overall and I really did not notice a remarkable difference in my allergy symptoms. It was very subtle and to be honest, I did not appreciate the taste or smell of the substance at all. The smell that lingered afterward was absolutely disgusting to me and the aftertaste of it when it drips down your throat makes me want to throw up. 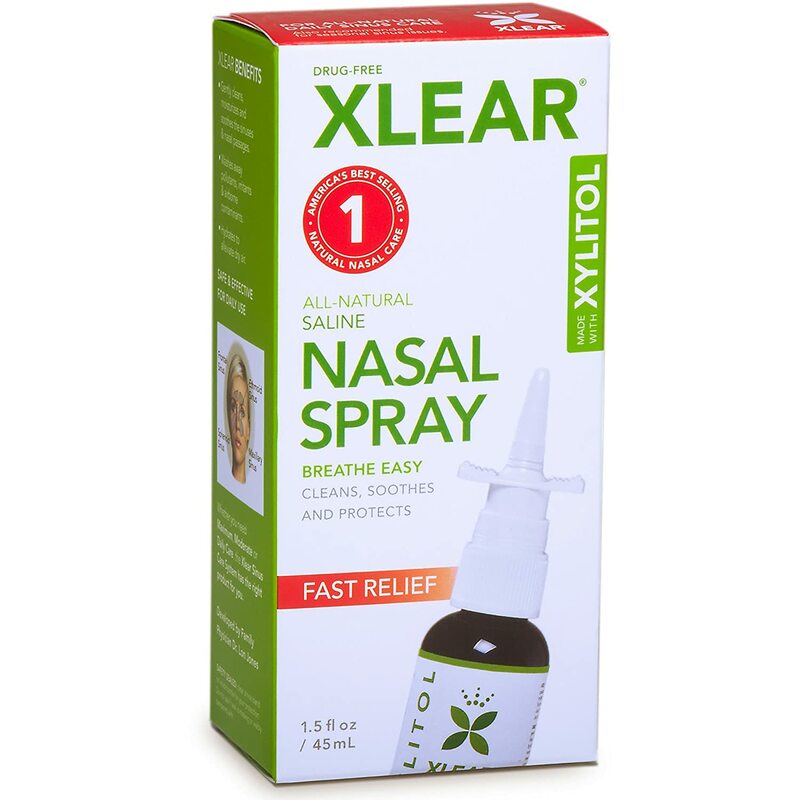 However, it seems to work for a lot of other people and I wrote a Flonase nasal spray review here that you can check out. Rhinocort or Budesonide is a little bit better in my opinion. It was noticeably effective and the taste and smell were not unbearable at all to me. Usually, the taste and smell of something is not a problem for me anyway, but something really turned me off about Flonase. I would also say that Rhinocort is a bit more gentle than the other two. Though, the effects don’t last long enough to be desirable and worth it to me. It seems to me that Nasacort is the better of the three because it is the most noticeably effective and doesn’t taste gross in my throat every day. Again though, it is the harshest and most unhealthy to use for the long-term with risks for addiction and withdrawal symptoms. I keep this allergy nasal spray on hand and it does wonders for me. It doesn’t cause any side effects and isn’t addictive. I do not use Nasacort anymore because of the long-term effects it had on my health. I was becoming very addicted to it and the side effects were a little bit annoying. It also seemed like the effectiveness subsided over time. At first, it was awesome, but by the third month, it just made me feel “normal” again with slight allergy symptoms regardless. So what really works for allergies then? That’s what my site is about: figuring out what is causing allergies in your lifestyle and then treating your health accordingly. Unfortunately, there is no one answer to why you are having severe allergies because everybody is different in their health, genetics, diet, exercise, and lifestyle. All of this affects everything else in your health and it’s ignorant to think that the things you do don’t affect you for the long-term future. Personally, I found that my severe allergies to the seasons and many foods, including my many food intolerances and chemical sensitivities (that have gone away by now) were due to a poor lifestyle that affected my health negatively when I couldn’t even realize it. Some unnoticeable health conditions I had were sulfur deficiency and malnutrition (which is common in young people now) and intestinal parasites that worsen allergies. After supplementing with organic and bioavailable sulfur, which is becoming scarce in our inorganic soils, and doing a natural parasite cleanse, my allergies improved tremendously. Some of my allergies are even gone now. From time to time, I still experience allergy symptoms and treatment does help me a lot. However, I want to reject addictive drugs and things that can possibly affect my health adversely, like these nasal steroid sprays. What really works for me is a gentle and natural nasal spray for allergies and using a neti pot for irrigating the physical causes of allergy symptoms that set your body off. This, among many other things, have helped me treat my allergies naturally to the point where they don’t even bother me at all during the day. Is Nasacort a Steroid or Antihistamine? Nasacort is considered a corticosteroid, rather than an antihistamine. It works to forcibly relieve inflammation that is caused by your body in response to the allergens that it was recently exposed to. Antihistamines are more gentle and simply get rid of the histamine and other allergy chemicals that your immune system produces in a response to allergens. Does Nasacort Cause Weight Gain? Nasacort or other triamcinolone medicines do not cause weight gain directly. It only has to do with the inflammation in your sinuses and does not affect the root cause of weight gain directly or indirectly. What causes weight gain is an excess of intake of calories and sugar, in combination with other things like exercise. Nasacort does not seem to affect your appetite, which may indirectly cause weight gain by making you eat more food. Does Nasacort Increase Blood Pressure? If you have a question or something to add to my Nasacort triamcinolone nasal spray review, please leave me a comment below! I would to read more about nasacort nasal spray review. Please keep posting and its features. It will be very much helpful for us. My insurance and medicare will no longer pay for nasonex.The pharmacist suggested nasocort , after taking for two nights, my lips swelled and with severe tingling.I know it’s the nasacort because I haven’t used anything new. I have rheumatoid arthritis and tinnitus, I don’t know if. that has anything to do with it.. It sounds like you might be allergic to the Nasocort spray itself. I would tell your doctor about this and see what alternatives they might suggest. Wow this is a very in-depth Nasacort review. Usually people stop after 2 sentences on like amazon and other drug websites. I was not sure if triamcinolone was addictive, but I guess it is kind of dumb to not think that anything can be addictive. Nasacort is also a steroid so it has a bigger effect than you think. I feel like the world needed a really personal Nasacort review for allergies. I don’t really trust other drug websites or the actual brand website itself to tell me the truth. However, I have tried this stuff and many others like it so I feel like I’m qualified to make a good Nasacort allergy review. Thanks!